Is old technology limiting your growth and threatening your security? You can achieve true transformation by moving to the Cloud – providing you have the right Cloud strategy and the right way to get there. Our team of Cloud computing consultants helps you build and execute a comprehensive Cloud strategy that aligns with your business goals and budgets while helping reduce overall IT operations costs by migrating away from legacy on-premises datacenters. We can then help you modernize to native Cloud applications and benefit from the predictive results you can gain through Cloud machine learning and AI analytics. The modern workplace is at the foundation of digital transformation. It is all about empowering employees to be more productive in a safe and secure way. Digital Transformation for the Modern Workplace brings together the power of the Microsoft Platform and expert consulting to help you plan and execute an approach that fits the way you do business. Your next step is to make sense of the Cloud. We work closely with you to define and understand the costs and timeline behind your Cloud strategy. Learn more about our Ground to Cloud Strategy Roadmap. 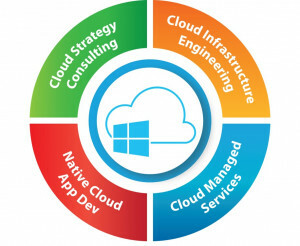 With your strategy and roadmap in place, our certified Microsoft Azure team sets you up with Ground to Cloud Essentials, ensuring you have what you need for a healthy and cost-effective solution. Have on-premise systems that aren’t available in the cloud? With Ground to Cloud System Lift & Shift, you can tap into the performance power of Azure with any system—even those that remain on premise. If you’re currently using an on-premise version of Microsoft Dynamics GP, Dynamics AX, Dynamics CRM, or another ERP or CRM system, you can also take advantage of Azure with our Migrations offerings. You’ll keep the features you trust in your application while gaining the power and flexibility Azure brings to the table. Do you have a plan for recovering from an outage or other disaster? High Availability and Disaster Recovery takes the anxiety away by leveraging the best of Microsoft technology for creating a dependable solution that minimizes costs. We help you move out of the IT business so you can focus on what you do best. With Business System Integration, we leverage a combination of Microsoft technology, AKA’s integration tools, and our Azure expertise to integrate all of your systems so they are working together in complete harmony, regardless of their function or where they reside. The proliferation of data across multiple cloud solutions and on premise systems makes the idea of “good” analytics complex and costly. With Azure, there’s no need for traditional data warehouses. Cloud Data Platform and Predictive Analytics leverages Power BI and machine learning to provide you with complete, flexible, cost-effective reporting and analytics. Are you ready for true digital transformation? Let us help you move your on-premise platforms and applications to Azure and get ride of expensive platforms like Oracle with App Modernization. Leave managing your Cloud environments to the experts so you can concentrate on running your business. Our premier managed service product is a full, turn-key IT Operations managed service. Learn more about Cloud Operations Managed Services, including the AKA Cloud Management Service Platform.